As a new Army Ranger, Payson acquired many hard-earned lessons. But dodging snakes and alligators while navigating a Georgia swamp one moonless night, he learned two lessons in particular that can help project managers navigate their software projects. Ah, the annual review. It's time to find out what your boss has planned for your career over the next twelve months. But wait, it's your career. Don't wait for your employer to direct your growth and development—take responsibility your future. 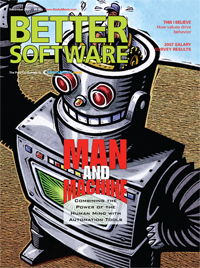 Drawing on real events from the authors' combined experience, this story picks up where it left off in the November 2007 issue and follows a fictional team as it encounters some of the pitfalls of using test-driven development. A company expresses its values through its mission statement, but an individual expresses his values through his actions. What happens if these values don’t mesh? Discover ways to examine the values that drive behavior in your organization and bring them to the forefront of discussion to guide you down the career path that is right for you. Instead of viewing software test automation as an effort to replace manual tests think of it as a means to extend the abilities of the tester. Combining the power of the human mind with automation tools helps fuel observation and discovery and provides a different perspective of the software under test. A good working relationship with your human resources department can help you simplify your recruitment process. Learn to work together to find the candidates who are best suited for the position rather than relying on the "skill-list shotgun." In the testing business, we are infected with counting disease–we count test cases, requirements, lines of code, and bugs. But all this counting is an endemic means of deception in the testing business. How do we know what numbers are truly meaningful? Software development has really changed over the years, and programming languages have evolved along with it. Learn more about D, one of today's more interesting languages; it's a high-level, type-safe language with the efficiency of C++ and the convenience of Java.